A nebula  is an interstellar cloud of dust, hydrogen, helium and other ionized gases in a galaxy. The Persian astronomer, Abd al-Rahman al-Sufi, mentioned a true nebula for the first time in his book, Book of Fixed Stars (964). He said that there was a "little cloud" near the Andromeda galaxy. A nebula is usually made up of hydrogen gas and plasma. It may be the first stage of a star's cycle, but it may also be one of the last stages. Many nebulae or stars form from the gravitational collapse of gas in the interstellar medium or ISM. As the material contracts, massive stars may form in the center, and their ultraviolet radiation ionises the surrounding gas, making it visible at optical wavelengths. The size of these nebulae, known as H II regions, varies depending on the size of the original cloud of gas. These are sites where star formation occurs. The formed stars are sometimes known as a young, loose cluster. Other nebulae may form as planetary nebulae. This is the final stage of a low-mass star's life, like Earth's Sun. Stars with a mass up to 8-10 solar masses evolve into red giants and slowly lose their outer layers during pulsations in their atmospheres. When a star has lost enough material, its temperature increases and the ultraviolet radiation it emits can ionize the surrounding nebula that it has thrown off. The nebula is 97% Hydrogen and 3% Helium with trace materials. In the past galaxies and star clusters were also called 'nebulae', but no longer. Nebulae can be sorted by what they look like and why we can see them. Large regions of ionised hydrogen gas are produced by star-forming regions. 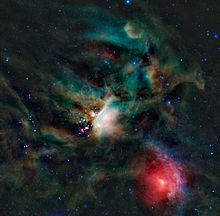 Nebulae are often star-forming regions, such as in the Orion complex. In these regions gravitation pulls together gas and dust. Material clumps together to form larger masses, which attract further matter. Eventually this become massive enough to form stars. The material left over may form planets and other planetary system objects. Emission nebulae make their own light. They are often called H II regions, because it is the ionized hydrogen which makes them glow. Usually the gases in an emission nebula are ionized. This makes them emit light and infra-red radiation. Reflection nebulae reflect light from nearby stars. Dark nebulae do not emit light or reflect light. They block the light from stars that are far away. Planetary nebulae are quite common, because they are produced by red giant stars late in their lives. These stars usually become white dwarfs, leaving behind an expanding ball of ionized gas, which we see as a roughly circular bright nebula. A supernova occurs when a high-mass star reaches the end of its life. When nuclear fusion in the core of the star stops, the star collapses and explodes . The expanding shell of gas forms a supernova remnant. The Crab nebula is a supernova remnant which probably exploded in 1054 AD. Light and X-ray emission from supernova remnants comes from ionized gas. There is a huge amount of radio emission called synchrotron emission. This emission originates from high-velocity electrons oscillating in magnetic fields. ↑ Harrison, T.G. (March 1984). "The Orion Nebula — where in history is it". Royal Astronomical Society Quarterly Journal 25 (1): 70–73. "Space-and-Telescope.com". space-and-telescope.com. Retrieved 24 September 2010. This page was last changed on 9 November 2018, at 21:21.